“Boston Young Contemporaries,” a juried show organized each year by students in the master of fine arts program at Boston University, spotlights art by MFA candidates from New England art schools. It has scaled down in recent years; and the current, concise show at BU’s Faye G., Jo, and James Stone Gallery features 19 artists chosen by painter Sean Downey. Only a couple of works are topical — a surprise these days. Paintings dominate the exhibition (Downey’s bias? ), especially paintings by BU students. Maybe the organizers aren’t doing enough outreach, or BU’s School of Visual Arts, since Josephine Halvorson became chair in 2016, has upped its game. Ardis Tennyson-Loiselle’s “Mother Bird,” in a noxious, steamy palette and several textures, flips a nurturing idea into a power play, as a woman places something in a man’s upturned mouth. Katherine Gardener’s abstract “Beach,” in black oil stick on stitched fabric, shudders with a nuanced sense of space. In Tzach Shiff’s “My Star,” a biomorphic cutout opens a glossy window onto a painterly geometry. All three are from BU. 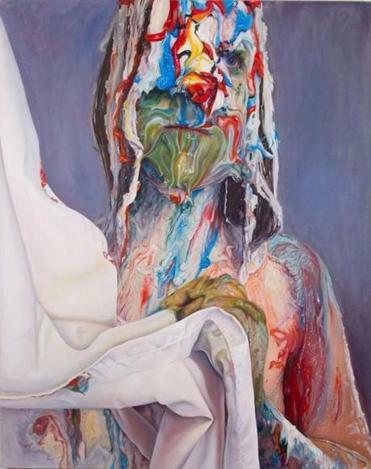 The painting I can’t get out of my head is by Marisa Adesman, of the Rhode Island School of Design. “Vertumnus’ Bride,” a nod to the late Renaissance painter Guiseppe Arcimboldo’s portrait of Holy Roman Emperor Rudolf II as Vertumnus, the god of seasons and plants. Arcimboldo fashioned him from vegetables. Adesman’s paints her monstrous bride in streaky globs — rather, she applies the paint delicately, but makes it look like impasto, commenting on trompe l’oeil, facture, and a painter’s kinship to Victor Frankenstein, all in one go. “BYC” isn’t all painting. Maine College of Art’s Golaleh Yazdani delivers a winsome animation and Krystle Brown, of the School of the Museum of Fine Arts at Tufts University, has a hypnotic video of a ritual amid urban rubble. Larger iterations of the show have offered occasional rough but eye-opening glimpses of where art is going next. This year’s isn’t as conceptually daring, but the talent is deep.